I hope everyone had great holidays and I wish all a fabulous New Year. I have finally been able to get out on Norfork Lake. A holiday vacation and then cold weather kept me off the lake for a couple weeks, but I'm glad to be back! 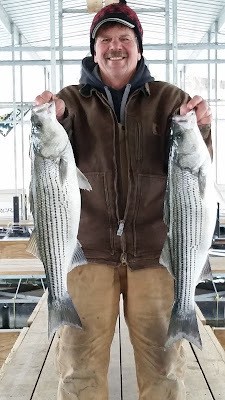 Fishing on Norfork Lake has entered the winter phase of the fishing cycle, meaning the shad are going into deep water and the fish are following. 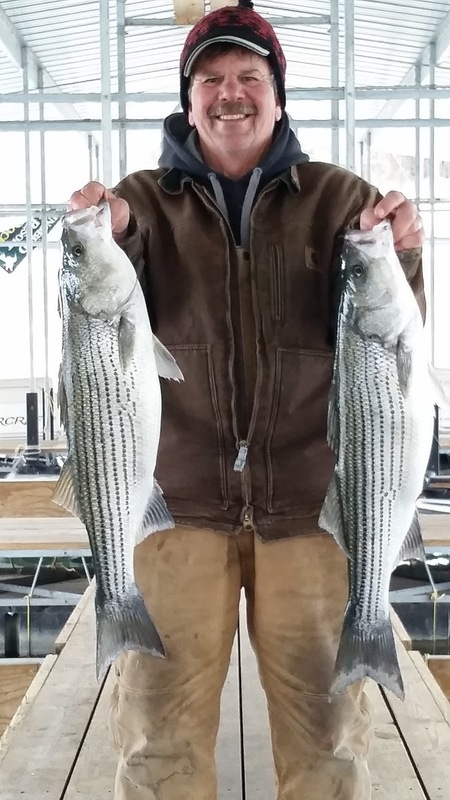 In mid December I was catching fish on large flats in 40 - 60 feet of water. 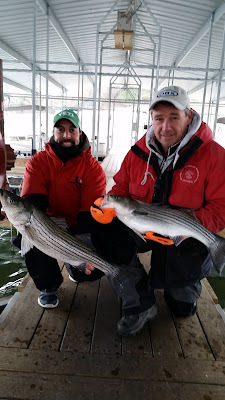 Over the last week I have found large schools of striped bass, hybrid bass and white bass out closer to the main river channel or main creek channels. 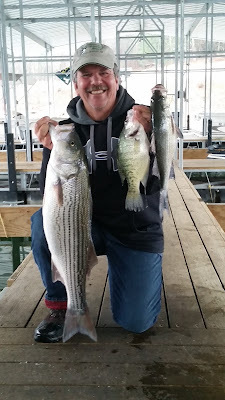 I have been catching stripers in 60 to 100 feet of water and the fish are suspended 30 - 60 feet deep. My favorite winter time bait is a spoon. I find the fish and drop a spoon down to their depth and start jigging the spoon up and down. With cold water the jigging method should be slowed down. The fish are still active, but are starting to slow down and don't necessarily want to chase it. You can also troll with swim baits or Alabama rigs. The hardest part about trolling is getting your bait down to the correct depth. Down riggers, lead core line or in-line weights are different ways to get your bait down while trolling. Live bait is also working very well. During the cold months I use big shiners. The stripers seem to like them just fine. 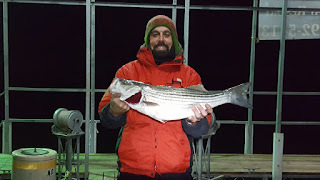 Over the last week I have found stripers in the major creeks such as Float and Panther. You will also find stripers from the 62 bridge area down to the Howard Cove area. The best part of winter fishing you do not necessarily need to be fishing at the crack of dawn. Monday afternoon I found large schools of feeding fish a 1 pm and it lasted all afternoon. I will have a report on bass and crappie fishing on my next report as I have been concentrating on striped bass over the last week. I did pick up a nice crappie 70 feet deep while striper fishing. They can be anywhere in the cold water. Norfork Lake surface water temperature Monday afternoon was 48.5 degrees. I do expect a slight rise in water temperature over the next several days due to the warmer than normal days and nights. Norfork Lake level is falling slowing and currently sits at 548.53. Periodic power generation is occurring during a large portion of the day. The main lake is clear, but the creeks and coves are stained.